In “Čigota” Special Hospital, on 26th March 2014. at 12 a.m. a gym that has been renovated within the CBC project "Development and Promotion of Health and SPA tourism in the cross-border area of Bosnia and Herzegovina and Serbia", was opened. CROSS SPA project is funded by the European Union and implemented by the Tourist Organization of West Serbia from Užice, in partnership with the Foundation of Local Democracy Sarajevo. Project partners are “Zlatibor” Regional Development Agency from Užice and Sarajevo Regional Development Agency (SERDA). Private Sector Development Programme (PSD), Swiss Import Promotion Programme (SIPPO) and National Tourism Organisation of Serbia established the cooperation in order to prepare Serbian tourism businesses to present their offer at Berlin ITB tourism fair in the next three years period. On this occasion, PSD and SIPPO and SIPPO and National Tourism Organisation of Serbia signed the Service Agreements in Berlin at ITB fair 2014. 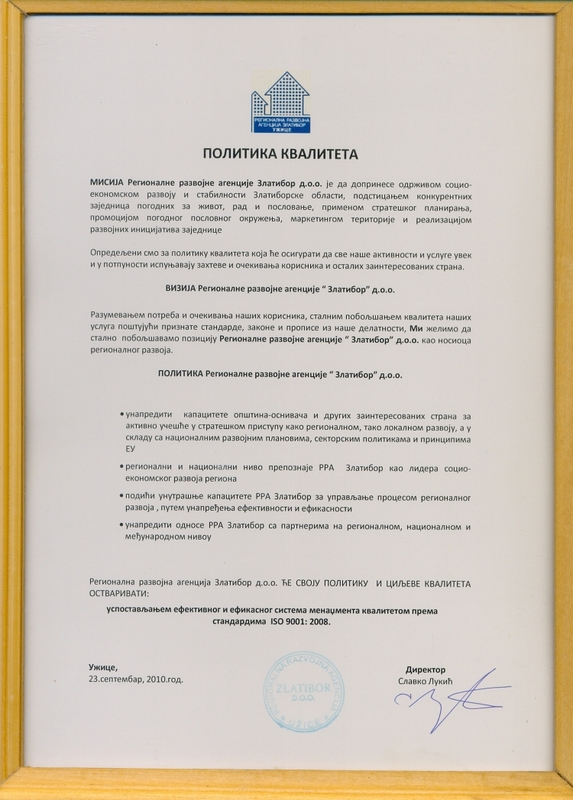 Ceremony of certification of thirty-eight students that attended additional trainings for cookers, waiters and bartenders was held on June 5th 2012. in School restaurant on Zlatibor. On Friday, May 25th, 2012, Tourism and catering school of Cajetina reopened redesigned School restaurant on Zlatibor. The restaurant is renovated in order to provide better conditions for vocational education of future caterers and affirmation of catering as a profession. Fruit producers and processors presented their offer on international fruit and vegetable fair-Fruit logistic held from 8-12th February in Berlin. Association "Women's Center" Uzice, supported by the Regional Development Agency "Zlatibor" through the Private Sector Development Programme in South West Serbia-PSD, during December has held workshops with women from rural areas in the municipalities of Zlatibor County covered by PSD project-Uzice, Arilje, Priboj Prijepolje, Nova Varos. Why hotel tables lack with tradiotional products?